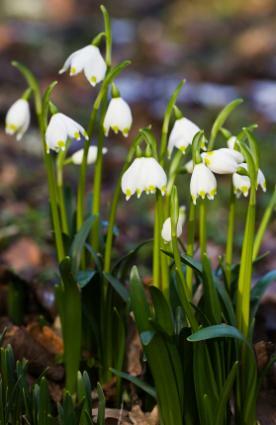 Snowflake (Leucojum) - Snowflakes are pretty, early-blooming perennial bulbs allied to the Snowdrop, but bolder and easily naturalised in rich valley soils. Flowers are bell-shaped and white or pale pink. This plant is appropriate for gardening zones four through nine. For best snowflake cultivation, plant in an area that receives full sun. Plants should be spaced more than a foot apart, with ideal of 15 to 18 inches apart. Depending on variety, they may grow from one to two feet tall. Snowflake's water needs are average. Summer Snowflake (Leucojum Aestivum) - A vigorous plant, flowers white drooping on stalks 1 to 1 1/2 feet high, and clusters of four to eight on a stem, with leaves shaped like those of Daffodils. It blooms early in summer (in many places before the end of spring), and is pretty in mixed borders or on the margins of shrubberies. It thrives in almost any soil, but is strongest in deep alluvial soil, and is multiplied by separation of the bulbs. It is excellent for the wild garden, and increases as rapidly as the common Daffodil. A form of L. aestivum is L. Hernandezi, a native of Majorca and Minorca, growing to about the same height as L. aestivum, but with narrower leaves, flowers only half the size, and usually not more than three flowers on each stem, appearing nearly a month earlier. Leucojum Carpaticum - Is considered a variety, bearing two flowers on the stem, flowering a month later. Other cultivated Snowflakes are L. hyemale and L. roseum; but these are very rare, and somewhat difficult to cultivate. Spring Snowflake (Leucojum Vernum) - A beautiful early flower about 6 inches high. The fragrant drooping flower resembles a large Snowdrop, the tips of the petals being marked with a greenish spot. It is excellent for the rock garden or borders, and thrives in a light, rich soil. Imported bulbs make little show for the first year or two, but when established they flower freely. The delicate beauty of snowflake blooms makes a lovely counterpoint to some of the more dramatic spring flowers. Consider adding this plant to your own garden.